Our journey to New Zealand started quite unexpectedly. Pulling up to one of the many ‘freedom camping’ spots across New Zealand, we knew that we had made a great choice. The empty beach stretched as far as our eyes could see, with snow-capped mountains in the distance seeming to disappear straight into the ocean. A few other travellers had braved the cold weather and parked up for the night, but we definitely felt like we had the entire place to ourselves. 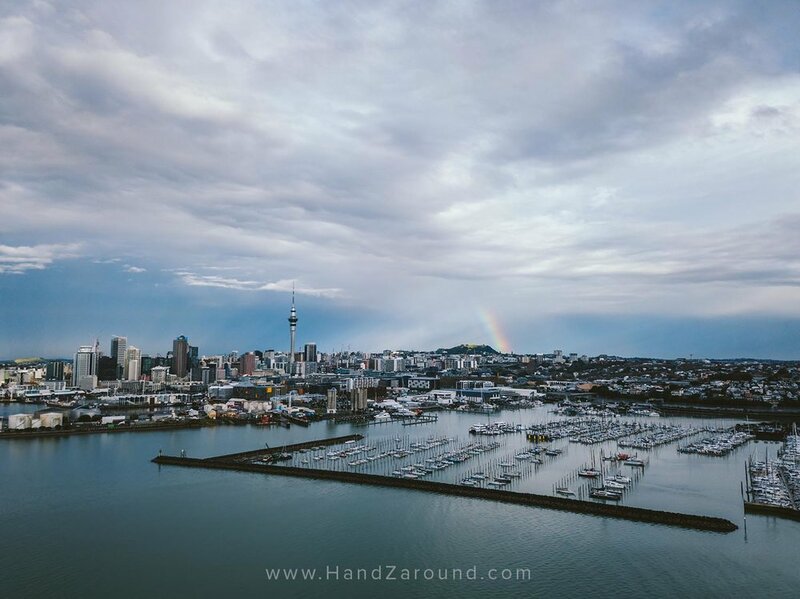 This is Part 1 of HandZaround’s New Zealand Road Trip - Two Week Itinerary about the North Island. To see Part 2 of HandZaround’s New Zealand Road Trip Two Week Itinerary about the South Island, click here. Without a doubt, the best way to see the beauty of New Zealand is with your own camper. The freedom you get from being able to head down that dirt track, or take that lesser known road, or just soak it all up in your own time is undeniably the stuff travel dreams are made of. 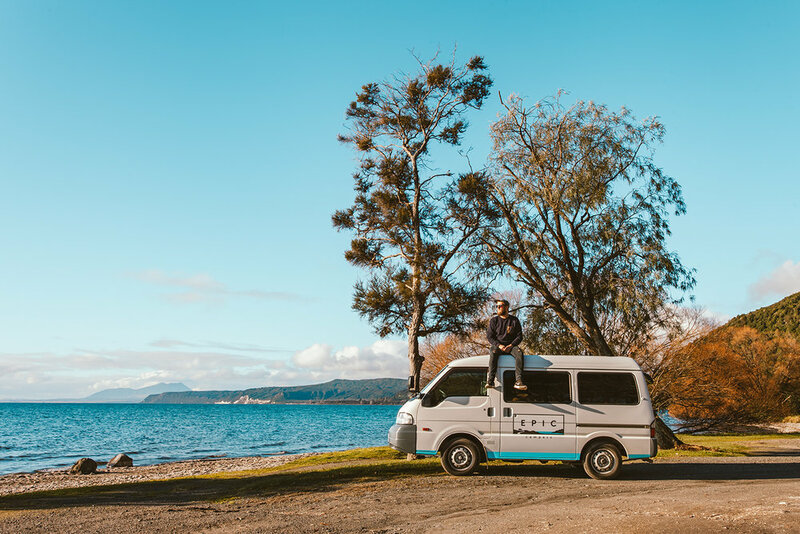 We picked up our Epic Camper in Auckland and made the two-week journey from the ‘busy’ Auckland CBD down through the North Island, across the ferry to Picton in the south Island, along the West Coast and eventually to Christchurch via Arthur’s Pass. 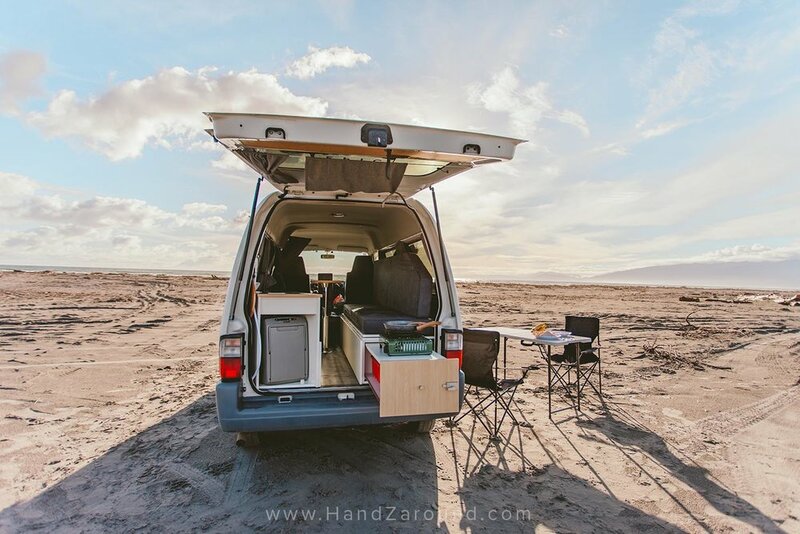 The whole experience of seeing New Zealand in a camper van was one of our favourites yet. We are seriously dreaming of the day we can do it again, and next time we’ll be sure to do it for much longer! A quick google search on places to rent a van in NZ will return many results. Your first dilemma will be actually deciding which company to go with. The range of campers is phenomenal and you will really want to think carefully about the van you choose to hire. What do you actually need the van for? How many nights will you be sleeping in it? Is the van self-contained (and has a sticker confirming that) so you can stay at the freedom campsites? Are you confident driving a bigger van or only something smaller? Are the company’s vans reliable and up to standard? Do you plan on cooking your own food? Does the van look cool or, does it have outrageous (and outdated) branding on it? Which van rental company in new zealand to choose? Our Epic Camper was exactly what we needed! Table & sofas converted into a spacious bed. We had a little kitchen set-up for cooking. It actually had all we needed, which was difficult to find whilst searching through other very popular companies like Spaceships Vans or Jucy Vans. It was small, easy to drive, but had a huge comfortable bed that converted into comfy sofas and a table. It had subtle and stylish branding which wouldn’t look outrageous in the photos but rather add to the whole road trip vibe. And most importantly, it was self-contained, had charging sockets and didn’t burn too much fuel which meant our trip would be affordable. Still not sure about an NZ road trip? Check out our film for Epic Campers! Most likely you will hire your van in Auckland and have the option of dropping it off in the North Island at Wellington or in the South Island at Christchurch or Queenstown. We decided that we would have enough time to drive from Auckland to Christchurch and we'd love to share our itinerary and some of the things that we loved about our journey across NZ. Kiwis have a love/hate relationship with the country’s biggest city (no…it is not the capital - Wellington is! ), but we really enjoyed it. After picking up our van, we drove for about an hour or so out to Piha Beach. The windy road was super scenic and the beach in Piha is wild. The waves thunder along the coastline and Lion’s Rock stands proudly looking over the Tasman Sea. Towards sunset, we made our way back into the CBD so we could catch the sunset from the Harbour and then headed up to Mt Eden to check out the excellent viewpoint a top of the extinct volcano. An easy drive from the CBD and we found ourselves at the base of the Coromandel. The biggest town in the area is Thames and it can be used as a base to loop the Coromandel Peninsula the next day. We stayed a little bit away from Thames in a small farming town named Puriri with a local family (who you can see in our New Zealand video). Make sure you fill up your van with fuel here as petrol stations are scarce along the Peninsula. Cathedral Cove - we couldn’t stop looking at all the beautiful nature around us! The loop around the Coromandel Peninsula is about 3.5 hours of non-stop driving. It will definitely take you longer as there are so many places worth stopping by. We were forced to drive along the east coast of the Coromandel as there had been a mud slip along the western coast and the road was closed. We drove along the windy and picturesque road from Puriri to Cathedral Cove in the morning (1.5 hours) to check out the famous beach - and we certainly were not disappointed. Access to the cove is only by a 45-minute walk through the coastal forest on a smooth path that meanders up and down. The path is in excellent condition with plenty of spots to rest and take in great views. If you are lucky and it is not busy, you can park at the beginning of the walk, but during the summer and busier times, you will have to park in the nearby town Hahei and take the shuttle bus for 5 NZD one-way. After seeing the spectacular Cathedral Cove, you can visit Hot Water Beach - as the name implies, the water under the sand is hot! At low tide, you can dig a shallow pool for the hot water from thermal springs to rise. Grab lunch at either Manaia Cafe, Coraglen Tavern or Colenso Cafe. The drive from the Coromandel to the touristy town of Taupo Town is quite easy. The town is situated on the biggest lake in New Zealand and is a very busy tourist spot. The lake is stunning and towards the south end, we got our first glimpses of the snow-capped mountains of NZ. The town of Taupo has everything you need and is a great place to get info about the entire country. We stayed a bit further down from Taupo Town in a place called Motuoapa which is right on the water’s edge. We began our full day in Taupo by backtracking a bit and heading up to the Huka Falls, just north of the lake. These waterfalls are on the Waikato River and are seriously powerful. We really enjoyed that we could park our Epic Camper about 100m from the falls and just walk around on the designated paths to check them out. There is no cost to see the falls, but there are options for a jet a boat ride or other activities that will get you really close to the falls. There are walking tracks that last anywhere from 20 minutes to up to 3+ hours. After seeing the falls we began to make our way along the eastern side of Lake Taupo simply to enjoy the stunning road. The road winds its way along the lake’s shores and provides more than enough ‘woah!’ moments as you go around each bend. You can also check out the Huka Prawn park if you fancy trying to catch your own dinner but we found it a bit too touristy and decided to skip it. It is definitely worth getting out on to the lake at either sunset or sunrise for some spectacular views of the mountains in the background. If you can’t, there are many picnic spots right by the water’s edge that offer spectacular views on the lake. We also wish we had time to see the Maori Rock Carvings situated in the rocks on Lake Taupo but we had to give it a miss this time! The road from Lake Taupo to Ohakune is simply stunning. We decided to take the Desert Road as our preferred route. If you are using Google Maps, make sure you set this route as it will automatically take you another way around the far side of the national park. The way we took is 10 minutes longer but 100% worth it - we stopped at least 10 times along the way. We loved how the environment changed from the lush forest near the lake to low shrubs as you pass through into the desert. As you drive along the Desert Road you will see the stunning Mt Ruapehu from your car’s window for a good hour. We found its beauty to be almost distracting as we drove along the road! Once we got into Ohakune we checked out the town centre and met some new friends (thank you KJ & Marama!) who suggested we try the burgers at Blind Finch - they were some of the best we’ve ever had! Make sure you get a delicious chocolate eclair from Johnny Nations Chocolate Eclair shop before you leave in the morning. On the way to Himitangi Beach, we stopped by Whangaui. Luckily for us there was a market happening along the river banks and we were able to grab a good coffee and some delicious locally produced food for lunch. The road from Ohakune to Whanganui was really spectacular! Oh, Wellington! We loved you! It really is the capital of NZ and it's a quiet city with everything you need. We felt like the city had a lot of character as it clings to the steep cliffs all around the harbour. We walked around the city centre for a bit and found more than a few places to get some food. We had some awesome Vietnamese noodles on Cuba st at 'R and S Noodle House' and also had a pint in a pub on the same street. There is a really cute cable car that will take you up the hill to get a great view of the city overlooking the harbour - or you can drive yourself up to Upland Rd to get the same view. We really loved that there was a place to park up the van for free that was less than a 10-minute drive to the ferry in the morning. The free spot to stay in Wellington was called Evans Bay Marina Carpark - Wellington, Overnight Campervan Parking. Also, this post contains an affiliate links, which means that if you book or buy something through our links, we will earn a small commission fee. It doesn't affect the price you pay, and we get to sustain our website thanks to these small earnings.